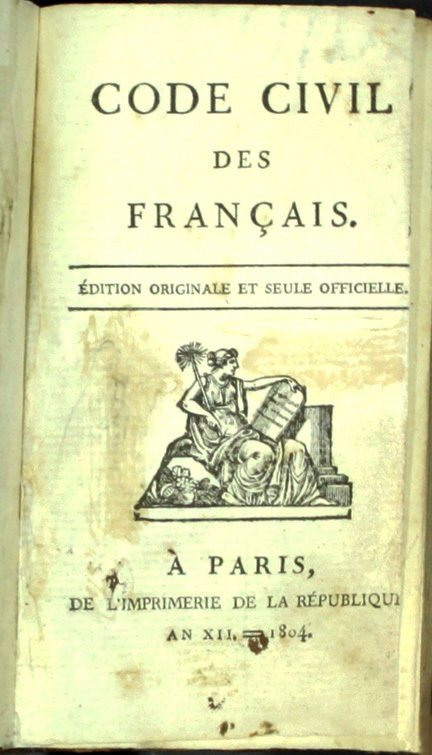 Code civil des Francais. Édition originale et seule officielle. Paris, de l'imprimerie de la République, An XII. = 1804. 10 cm. Contemporary full mottled calf with gilt spine. This is a first edition of the Napoleonic Code issued in 1804. It appeared in three formats simultaneously: 4to, 8vo, 16mo, of which the 16mo (this version) is least common. Before the Code, France did not have a single set of laws, and regional practice varied tremendously. Napoleon set out to reform the French legal system, abandoning in the process relicts of feudal and customary law. The Code permitted freedom of religion, and required that merit rather than birth determine eligibility for government position. It was drafted by a commission of four jurists, and attained force of law on March 21, 1804.